James Gray Senior said it was common for horses to "drop down dead"
Five people have been found guilty of neglecting more than 100 horses, ponies and donkeys on a Buckinghamshire farm. 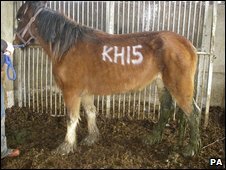 Horse trader James Gray, 45, and his son James Gray Junior, 16, were found guilty of 11 charges under the Animal Welfare Act 2006. His wife Julie Gray, 41, and daughters Jodie, 26, and Cordelia, 20, were each found guilty of two charges. Bicester Magistrates' Court heard RSPCA staff and vets removed 115 animals from Spindle Farm in Amersham last January. One dead horse was found on the back of a trailer with ropes around its tail, the court heard. The court heard many horses living at the farm were found surrounded by rotting corpses of other animals which had been left to die of starvation. RSPCA chief inspector Rob Skinner said he found 32 carcasses in different locations on the farm when he went to look round in January last year. Some of these had been dumped on a bonfire while others were left lying on the ground, covered in rubbish, the court heard. Nick White, a field officer for international horse charity World Horse Welfare, was one of the first at the scene. He said: "There were dead horses on the ground in front of me, and to the right. "I looked across there was a dead horse in the stalls. It was like walking into another world. "There were none of the normal noises I associate with a stable yard - horses moving about, eating, drinking, calling out to one another or the gentle noises that horses make when approached, expecting to be fed or cared for. They were totally silent." The court heard one pony was unable to stand and had to be rolled over so vets could examine it. Mr Skinner said: "When we rolled it over we could then see a large area on its side where it had been lying against a water trough. This area was hairless, pink and sore looking." A vet examined the animal and decided it should be put down immediately. James Gray Senior told the court it was common for horses to "drop down dead" and said some animals found on his land had died without warning or displaying any sign of illness. He said some corpses, which were left lying on his property for several days, were "family pets" which he was waiting to bury. 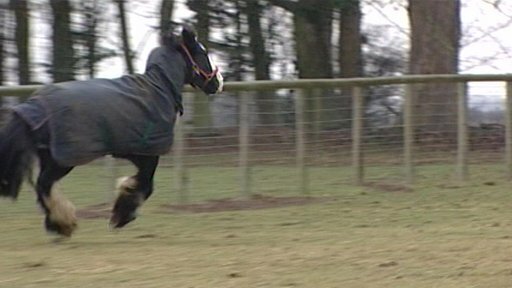 Norfolk-based horse charity Redwings helped remove 80 animals from the farm and brought back 21 to its own care. Lynn Cutress, Redwings chief executive, said: "The large rescue from Spindle Farm was the most distressing and upsetting operation our staff have ever been involved in. "We now look towards the sentencing so we can finally secure the future of the animals in our care." 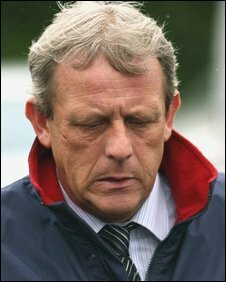 James Gray Senior, who has a previous conviction for causing unnecessary suffering to a horse, will be sentenced along with the four other members of his family on 12 June.